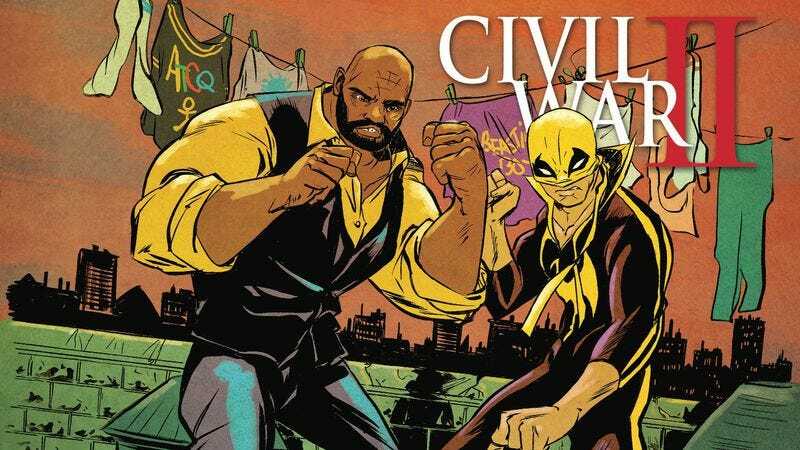 Luke “Power Man” Cage and Danny “Iron Fist” Rand are finally officially back together as the Heroes For Hire, but Civil War II is lurking in the shadows, waiting to strike at their fresh reunion. This preview of next week’s Power Man & Iron Fist #6 shows the eponymous duo reacting to the news that their superhero comrades War Machine and She-Hulk have fallen in battle, and writer David Walker heightens Luke and Danny’s emotional responses by delving into their past relationships with the victims. The most exciting thing about this preview is that it marks a significant improvement in the treatment of Jessica Jones, getting her out of the house for the first time in six issues and giving her a more active role in the narrative. Jessica is still critical of Luke and Danny but becoming more supportive, and Walker provides insight into Jessica’s parenting philosophy, which doesn’t shield her daughter from the horrors of the world. Artist Flaviano and colorist John Rauch are doing great work filling in for the regular art team of Sanford Greene and Lee Loughridge, with Flaviano maintaining the cool, expressive style that has made this book such a visual treat. He’s a relative newcomer to the industry, but he’s proving to be a talent to watch thanks to his skill for drama, comedy, and superhero spectacle, and teaming Flaviano with Rauch (an Eisner nominee this year) has elevated his artwork. There’s a lot to appreciate in this series, and this creative team can be trusted to mine significant character development from this Civil War II tie-in.